Bundesliga | Where did it go wrong for Carlo Ancelotti at Bayern Munich? Where did it go wrong for Carlo Ancelotti at Bayern Munich? 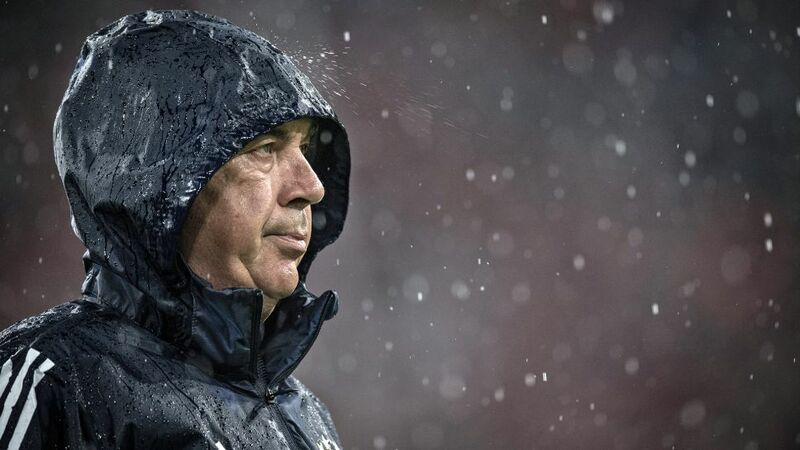 Carlo Ancelotti has been dismissed as coach of Bayern Munich following Wednesday’s 3-0 loss to Paris Saint-Germain in the UEFA Champions League. One loss does not a coaching job cost, not normally at least. So where else did it go wrong for the Italian tactician? Bayern never lose during Oktoberfest, everyone knows that. Munich's annual beer-drinking bonanza will wrap up early next week, and — so far — the Bavarian city's biggest team have not tasted defeat in the Bundesliga during the 2017 edition. But not even seven points from three games was enough to save Carlo Ancelotti from becoming the first Bayern coach to lose his job during the world-famous festivities. The coup de grace to the Italian’s reign was delivered by one of his former clubs, Paris Saint-Germain, with their 3-0 win in the French capital Bayern's heaviest group-stage defeat in the UEFA Champions League. Still, you couldn't say Ancelotti’s departure has come as a surprise, nor is it just the result of 90 minutes to forget in the shadow of the Eiffel Tower. Third in the Bundesliga table, three points off top spot after six games, would be considered a rampaging start to the season at most clubs. Bayern, of course, are not most clubs. In 2010/11, they were also three points off table-topping Borussia Dortmund after six matches, and Jürgen Klopp’s side went on to claim the title. Clearly, the Bayern bosses don’t want a repeat. A 2-0 defeat to Hoffenheim — Ancelotti's sole reverse in the league this term — showed not only how much the Sinsheim outfit have progressed, but also how Bayern have not, while last weekend's 2-2 draw with Wolfsburg was the first time the record Bundesliga champions had dropped points after taking a two-goal lead since February 2011. Still, a poor run of form — relatively speaking — and an embarrassing European defeat don’t explain everything. Bayern are not in the habit of flicking the switch and jettisoning their coach on something as temporary as that. No, the seeds of Ancelotti’s downfall were sown some time ago. Quiet leadership: winning hearts, minds and matches is the title of Ancelotti’s vaunted book on how to get the best out of those under you, but though only his predecessor, Pep Guardiola, had a better points-per-game average at Bayern, the former AC Milan, Chelsea and Real Madrid boss has never quite managed to convince fans, pundits and perhaps even his players that he could improve upon and extend his mightily impressive track record. Though he added the Bundesliga title — an annual requirement for any Bayern boss who wants to stay in his job longer than a season — last term, in Europe, the shortcomings of his team and tactics were apparent. The only manager to have won the Champions League on three separate occasions, Ancelotti was clearly brought in with the idea being he add a sixth European title to Bayern’s trophy cabinet. His squad reached the last eight of the competition last season before losing out to eventual winners Real. No shame in that, you may think, particularly given Arsenal had been slain 10-2 on aggregate en route. Still, the quality of that Arsenal side is measured by the fact they are in the UEFA Europa League this term, while the campaign was not always as glorious — remember defeat in Rostov? The manner of the loss at PSG — a club so often criticised by Uli Hoeness and Karl-Heinz Rummenigge — was the straw the broke the camel’s back. It was in fact just after that loss in Russia last season — in early December, Matchday 13 at Mainz — that Ancelotti abandoned his 4-3-3 formation to revert to the 4-2-3-1 strategy that had served Guardiola so well. Finally, at the OPEL Arena, it looked like the Bayern of old, precisely because it was just like the Bayern of old, but it returned despite Ancelotti rather than because of him, a default choice when his own had not worked out. Thomas Müller underpinned the 3-1 win, and looked far more comfortable in a position behind Robert Lewandowski rather than in the advanced, wide role Ancelotti had used him in previously, and which had given him so little opportunity to use his talents. In fact, Müller’s role proved a conundrum Ancelotti failed to fully solve, often resigning the Bayern icon to using his famed ability to exploit space in finding the prime spot on the substitutes’ bench. Such is Müller’s standing with the fans and within the club itself, when results did not go Ancelotti’s way, his decision to keep the Germany international on the sidelines was questioned all the more quickly. Müller was not the only one, though. This season, while Mats Hummels appeared first-choice, the 2014 FIFA World Cup winner has played alongside Jerome Boateng, Niklas Süle and Javi Martinez in central defence. Not because of turnover, but because Ancelotti never seemed sure of his best XI. Unusually for a coach with proven man-management skills, Ancelotti seemed to overestimate his squad. “He trusts us to make our own decisions out on the pitch,” rejoiced Manuel Neuer of Ancelotti in the early days of his new boss’ reign. Perhaps he shouldn’t have been quite so indulgent, particularly when they started making bad ones. The collective switching off at Hoffenheim that allowed a ballboy to catch them off guard and Sven Ulreich’s curious decision to use just one hand to try and keep out Maximilian Arnold’s free-kick are just the most recent, high-profile mis-steps. Ancelotti could easily — and quite rightly — argue that Neuer would not have made that mistake, while the retirements of Philipp Lahm and Xabi Alonso were always going to leave a gulf that it would take time to fill. Add to that the loss of Ancelotti's trusted assistant Paul Clement last season, and the Fates have not been as kind as they could have been to the ex-Bayern boss. But Ancelotti also had a duty to find solutions to those problems, particularly the leadership deficit within the dressing-room created by the Lahm-Alonso Auf Wiedersehens. He may also complain that he was not given the support he needed from above, but the Bayern bosses have been considerate in one way: at least Ancelotti still has time to don the lederhosen again, head to the south of Munich, and drown his sorrows before considering the next challenge into which he should invest his talents.